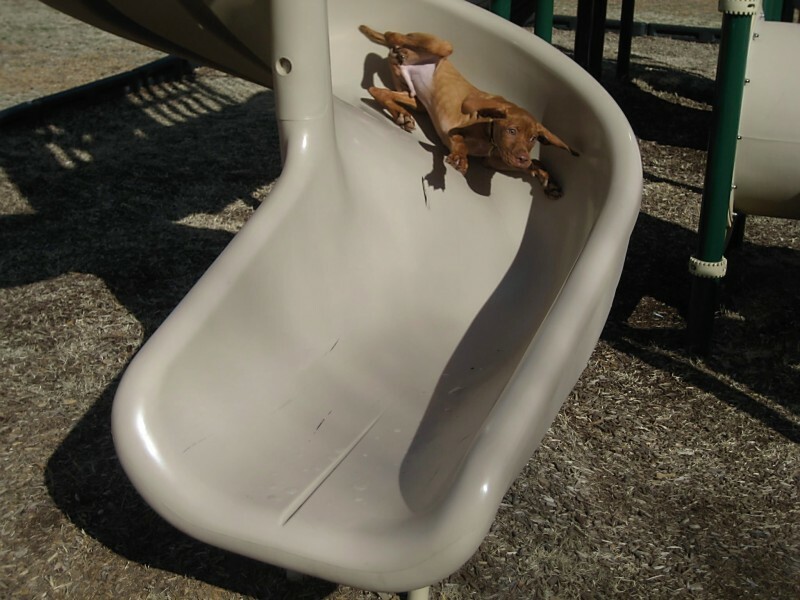 Arty, a past puppy, having fun on the slide ! (Pronunciation VEESH-la) "Vizsla" means alert & responsive . Jeff discovered the Vizsla's approx 23 years ago on a hunting trip and immediately knew he wanted to have this breed. Shortly after that we bought our 1st pair of Vizsla's and Jeff was so impressed by their intelligence and willingness to train he knew this was the type of dog he wanted to be involved in breeding. A Vizsla is a perfect companion for runners and outdoor enthusiasts. They are popular work and show dogs. Our male Vizsla is "G.O. ", short for "Game Over". G.O.has a great hunting pedigree with many field CH's in his background. He has earned an AKC "Jr Hunter" title and is doing a great job in the field with Jeff. Jeff takes him hunting at Otter Creek near Ohatchee and at Selwood (local hunting preserve in Childersburg ). G. O.has been DNA'd, as required by NAVHDA and AKC. Recent photos of all of the Vizsla's are on our facebook page, Wingshot Kennels. Click on the photos tab, look for an album titled "our adult dogs" . We suggest that you "do your homework" and read several books and/or internet articles about the Vizsla breed so you will have an idea of what to expect from your new puppy. If you know someone that already has a Vizsla please talk with them and get some 1st hand information. You might also visit a local dog park and talk with any Vizsla owners you see. A Vizsla is very energetic and is a "velcro dog"; they require daily personal attention and exercise; a Vizsla does not need to be crated all day or for long periods. If this will be your 1st time owning a puppy, please read a training book. For housebreaking, we suggest the crate training method. The Hungarian Vizsla (also referred to as the Hungarian pointer, Magyar Vizsla, and the Drotszorn Magyar Vizsla) is considered an ancient and dignified breed and was favored by the early Hungarian nobility. The exact date of origin and history are unknown, but writings and etchings of the breed indicate the dog (or one similar) is at least 1,000 years old. Vizslas were well matched to the type of weather conditions and game of the Hungarian plains. They were very popular as bird dogs and were used for hunting, pointing and falconry. They were also family companions. After World War I, the Vizsla had become almost extinct, but Hungarian immigrants brought the breed to North America in the 1930s. Today, the Vizsla is a popular gun dog, but his primary role is that of a companion. The AKC first registered the Vizsla in 1960. The Vizsla’s coat color is rust or golden rust, small white marks on the chest and toes are acceptable. His eyes are a deeper color than his fur. His body is stocky and well muscled. The Vizsla's tail is usually docked and is about 2/3 of the original length. Vizslas have large heads with squared muzzles and large brown noses. The ears are thin, silky and long. Vizslas have a very distinguished look about them. The strong body and broad chest make for a confident stance. The Vizsla ranges in weight from 40 to 60 pounds. They usually stand between 22 and 26 inches at the shoulder. Females are usually smaller than the male. Vizslas are loyal, trustworthy companions. Vizslas are responsive, alert, loving, and gentle; the Vizsla is somewhat willful and distractible, but smart and trainable. They love to socialize with the family, and enjoy playing games or just hanging out on the couch. Vizslas are exceptionally friendly. They take to children and guests, but love to be close to their owner. Early contact with people is needed and basic training should be introduced as a puppy with a patient but firm hand. Owners need to make their authority clear from the beginning. They are easy to train as they want to please their owners. Harsh training techniques can ruin the Vizsla; consistency in training is the best. Vizslas need human companionship and make wonderful family pets. They can adapt to city life and live in apartments if they have daily exercise and lots of attention. They generally get along well with other dogs and with children.